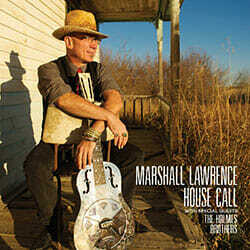 House Call received a GREAT review in Blues Blast magazine… Here it is..
House Call is Lawrence’s fourth solo release in the past ten years, and it builds on the solid work that he did on his previous award-winning albums. There are eleven original tracks (all written by Lawrence) and two covers, none of which run over four minutes. He takes care of the vocals, guitar, mandolin and hand percussion, and is joined by a pair of top-shelf players: Russell Jackson on upright bass and David “Hurricane” Hoerl on harmonica. These guys are awesome musicians; you may know Jackson from B.B. Kings band, and Hoerl from The Twisters. The album comes to a close with the traditional lament, “Death’s Black Train.” Lawrence called in a few more guest artists for this one, drummer Dwayne Hrinkiw and vocalist Barry Allen for some background parts. Hrinkiw lays down a heavy rhythm with his kick drum and snare that drives this song on relentlessly, and Allens voice is a good match for Lawrences as they harmonize through the chorus. This is yet another solid track and was a great choice to end things up. After listening to this album it is obvious that Marshall Lawrence understands the blues and has the ability to translate it for todays audience though his clever songwriting, deft fingers and soulful voice. This is one of the best new albums I have heard this year, and if you are a fan of Delta music or just like the blues, House Call is sure to please. Check it out if you get the chance! Next GREAT REVIEW of “House Call” in Blues In The Northwest out of the U.K.